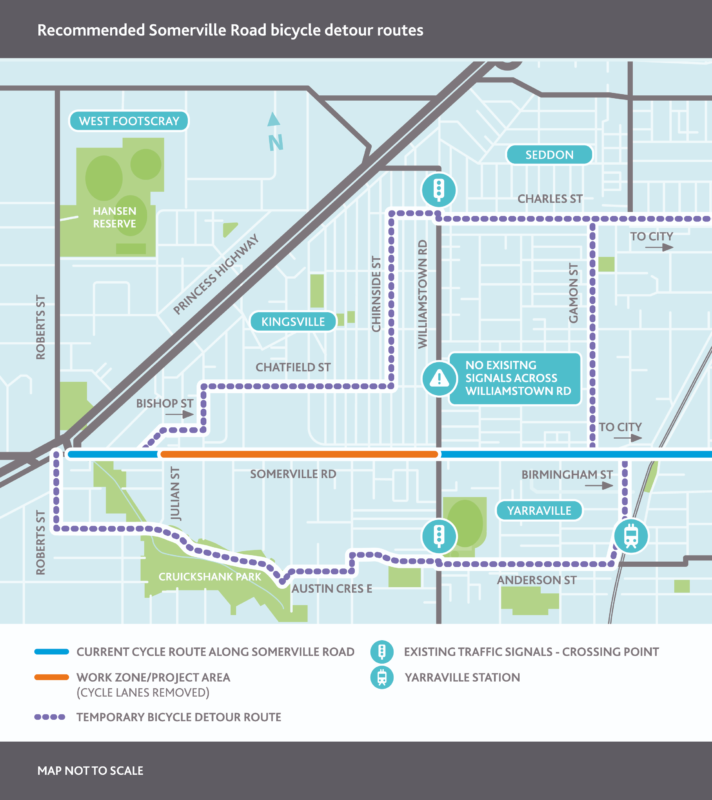 Riders face changed traffic conditions in Somerville Road, Yarraville for the next two months. Construction of the new M102 water main begins along Somerville Road at Julian Street and will progress east towards Williamstown Road, Yarraville. There will be bike lane closures as well as road closures and parking restrictions. With input from local riders and Bicycle Network, Melbourne Water has identified alternative routes that benefit from signalised crossings at busy roads. Check the map below for details, or download the Melbourne Water Community Bulletin here. Work on the new M102 main has been underway for many months, starting at Paramount Road, West Footscray, and is now 50 per cent complete. Work has recently been underway in Cruikshank Park, across Stony Creek, and along Charlotte Street (east) and Julian Street. Construction work will take place in the west-bound lane – including parking and bike lanes – along Somerville Road, Yarraville. Concrete barriers will be placed in the middle of the road to ensure the work zone is separated from vehicles. As the pipeline is constructed across intersections with local roads and side streets, access will be closed.